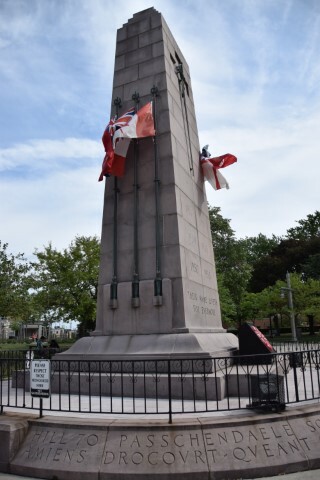 The Essex County War Memorial Cenotaph was erected as a fitting tribute to those men of Essex County who laid down their lives in the Great War of 1914-1918. It was constructed of Canadian Pink Granite based on a design of George F. Masson, a local architect. Rising to a height of 20 feet, the central shaft bears on its eastern face an incised panel forming a cross, which frames a gilded sword decoration, symbolizing the supreme sacrifice and its reward. On the front faces of the ramp are narrow panels of carved maple leaf sprays, symbolic of Canada. 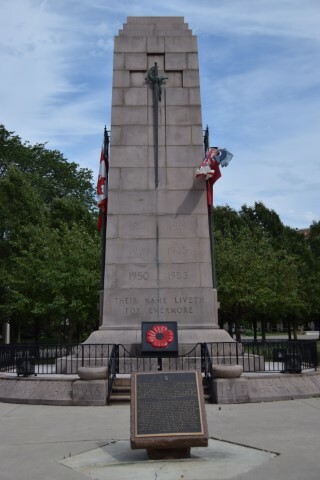 The cenotaph was unveiled on Armistice Day, November 11, 1924, by Major-General later Lieutenant General Sir Archibald Cameron MacDonell (1864-1941), a Windsor native and one of the highest ranking and most decorated Canadian soldiers of World War I. The cost of the monument was approximately $25,000, the nucleus of $5000 raised by the Ladies Auxiliary of the G.W.V.A. with the assistance of various local organizations, including donations from private individuals. 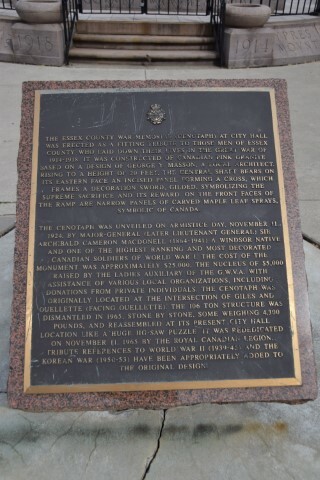 The cenotaph was originally located at the intersection of Giles and Ouellette facing Ouellette. The 106-ton structure was dismantled in 1965, stone by stone, some weighing 4300 pounds and reassembled at its present City Hall location like a huge jig-saw puzzle. It was rededicated on November 11, 1965 by the Royal Canadian Legion. Tribute references to World War II 1939-1945 and the Korean War 1950-1953 have been appropriately added to the original design.